A dental implant is essentially an artificial tooth root that is surgically placed into the jawbone. One or more missing teeth can be replaced by attaching a crown, a fixed bridge, or a full set of dentures on top of the implants. The implant material, which is typically pure titanium, is extremely biocompatible and the bone treats the implant just as if it was made out of bone. The bone cells attach themselves to the implant in a process called osseointegration. After an initial healing period, during which the implant(s) is left undisturbed underneath the gum tissue, it is uncovered and connected to a small post that serves as the foundation for the tooth or teeth that the implant will be supporting. Implants may be used to replace teeth in single-tooth spaces, groups of two or more missing teeth, or where the teeth are completely missing in one or both jaws. 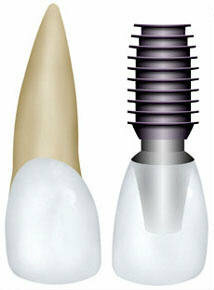 Once placed, the implants are used to support individual crowns, or bridges that are attached to the implants. Implants may also be used to help retain removable dentures more securely. Most patients who are healthy with no restrictions for undergoing minor dental surgical procedures and who also have good oral hygiene are good candidates for dental implants. Your dentist will assess the potential implant site to determine whether there is sufficient bone volume and gum thickness to allow placement of an implant. We begin by providing a clinical examination that will involve inspection, palpation, and gentle probing of the potential implant site and adjacent teeth. In straightforward cases, simple dental x-rays are usually sufficient to examine the bone. In more complex cases, specialized implant x-rays, known as tomograms, are usually required. Just like teeth, implants are not made to come out. Implants are not the same as natural teeth but they function and feel very much like natural teeth. For patients that have lived with removable appliances, the implant will feel much more secure. Some implants fail because the bone has not integrated sufficiently with the implant surface. Hence, implants are not "rejected" like an organ transplant; they simply fail to bond with the bone. This may occur if the bone is very soft at the time the implant is placed or if the implant is initially unstable. Other reasons include inadvertent loading of the implant via a removable denture or by the action of chewing hard food over the implant site during the early stages of healing. Infection may also cause an implant to be lost. Most modern implant systems report success rates of 85-95% over a 5 to 15 years period. Smoking affects the healing of bone and soft tissue by reducing the nutrients and minerals in the tissues as well as reducing the blood supply. This means that smoking is one of the biggest risk factors in failure of dental implants. Recent studies estimate that the chances of failure increase by two to three fold in a smoker. Gum and bone like a warm, moist environment and smoking produces a hot, dry environment. In most situations, an implant can be replaced if it fails to bond with the bone, provided adequate bone and gum tissue is present. Failures do occur, but not very often. In most cases, existing dentures and other temporary appliances can be worn immediately after implant surgery. There are exceptions, but our goal is to minimize any aesthetic concerns during the healing phase. In most cases, implants can be placed using local anesthesia in our office. In more complex cases, we may recommend that the surgical phase be performed while you are under general anesthesia in a specialist's office or in a hospital environment. In most situations, a healing period of between 3 to 6 months is required before teeth can be attached to the implants. A temporary appliance can usually be made to provide function and aesthetics during this period. After initial implant placement, regular follow-up visits are required to ensure that healing is progressing as we would like. After the teeth are attached to the implants, regular check-ups are needed every 6 to 12 months. At these check-up appointments, the implants are inspected and examined to ensure that the supporting gum and bone remains healthy. X-rays are taken to examine the bone structure around the implant. For the implant to function well and to remain healthy, proper oral hygiene must be performed at home on a daily basis. Special cleaning aids (brushes, and floss) are widely available. We will provide instructions on the proper use of these cleaning aids. It is important to note that no metal scrapers should ever come in contact with the implants because metal scalers can scratch the surface of the implants. Please see the Implant Gallery to view the types of results we can achieve with dental implants.